163 Via Veracruz Jupiter, Fl 33458 has been sold. PASEOS IN JUPITER! BEAUTIFULLY MAINTAINED 3/ 2.5 / 2 WITH A DEN (POSSIBLE 4TH BEDROOM) SINGLE FAMILY HOME WITH OVER 2,100 A/C SQFT OF LIVING. DESIRABLE FLOOR PLAN WITH OPEN KITCHEN FEATURING GENEROUS COUNTER SPACE WITH ROMAN EDGES, UNDER CABINET LIGHTING, CUSTOM CABINET MOLDINGS AND ALL NEW APPLIANCES. THE HOME HAS BEEN UPGRADED WITH BROAD BAND & SURROUND SOUND TO MEET TODAY'S FAMILIES DEMANDS AND A NEW AC SYSTEM. COMFORTABLE MASTER SUITE & BATH WITH ROMAN TUB, SEPARATE SHOWER, DUAL SINKS AND CUSTOM CLOSET. FENCED IN BACK YARD FEATURES EXTENDED BRICK PAVED PATIO & TROPICAL LANDSCAPING MAKE FOR RELAXING ENTERTAINING WITH THE PASEOS CLUBHOUSE & POOL ONLY TWO BLOCKS AWAY. CONTACT US TODAY FOR YOUR PRIVATE SHOWING! 163 Via Veracruz located in Jupiter, FL is a single family home with 3 bedrooms, 2 full baths and 1 half baths.The Home at 163 Via Veracruz was built in 2005 in Paseos and offers a 2 car garage. This Paseos Home offers pool, tennis, bike - jog, clubhouse, sidewalk, street lights. 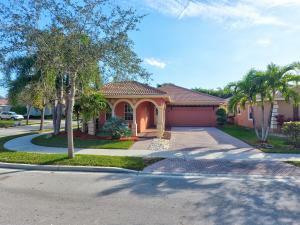 163 Via Veracruz Jupiter, Fl is currently listed for $499,000 under the MLS# RX-10403001. This Home has been put on the Jupiter MLS system and currently has a status of SLD.